Citrix Cloud is becoming mainstream now for many new deployments and there is a push to move existing on-premises solutions to the cloud.At the same time, there is a requirement for organisations to deliver the same level of monitoring cloud services that they have in place for the on-premises solutions. Large enterprise organisation’s and system integrators will be looking to understand how they can monitor the Citrix Cloud service to ensure that the service is meeting their expected SLA’s , Additionally , they need to determine how issues are detected, routed and notified to the appropriate IT staff and then acted upon proactively (instead of waiting for user’s to inform the service desks about these issues). What monitoring do you get with Citrix Cloud? These updates can be selected per region, and then, further by service, as indicated in the screenshot below. This will display Warning, Error & Informational messages. The example below shows a Cloud Connector which has not been switched on for a while and is outdated. Another way to access notification is the bell logo at the top right icon menu on Citrix Cloud menu. Citrix Cloud offers the ability to check the health status of the Cloud Connectors. This is accessible by browsing the hamburger menu :- click Resource Location , and then click the Cloud Connectors. This is listed by Resource locations. Click the arrow to expand the health check information on the Cloud Connector (Note: the green left-hand border indicate a good health status). Further detail on the Cloud Connector(s) -, such as Memory, CPU, Network Data & Disk Space, is also available. Unfortunately Citrix has not provided a Management Pack for any of its Citrix Cloud services. The Citrix Cloud Connector is a major component that is hosted within customer environments/resource locations. This is likely due to the announcement in this article with the recommendation to move to Citrix Ready Partner that provides monitoring and reporting services. This bring us to the next section of the article with a Citrix Ready partner, eG Innovations has added monitoring capabilities for Citrix Cloud in its eG Enterprise solution. eG Enterprise comes in two deployment models: an on-premises deployment and a fully SaaS-based service. For the purpose of this article, the SaaS based “eG Enterprise Cloud solution” has been used. Let’s look at the various aspects in which eG Enterprise provides monitoring for Citrix Cloud. The first aspect of monitoring Citrix Cloud using eG Enterprise is with the built-in Citrix logon simulator. This is a synthetic simulation tool that runs externally and checks logon performance and application/desktop availability for Citrix Cloud services. You can use the logon simulator to get alerted to logon issues proactively well before real users start complaining of logon slowness and connectivity issues. The synthetic test results of the logon simulator can also be used to baseline logon performance at various times and from various locations. A free version of the logon simulator is also available: http://www.eginnovations.com/express. This is the component I used eG Enterprise to monitor to test its Citrix Cloud monitoring capabilities. The Cloud Connector is running on a Windows box on the resource plane. To monitor the Cloud Connector, eG Enterprise requires a light-weight eG Agent to be installed on the Windows Server running the Cloud Connector. This Agent collects all the performance metrics about the Cloud Connector connectivity, processes, services, resource usage, and so on. Installing the eG Agent is pretty simple and can be done in a few steps. The eG Agent talks to the cloud-hosted eG Enterprise monitoring console which can be accessed over the web (HTTP/S). The following gives an overview of eG Enterprise monitoring console’s user interface.There are 4 tabs on the console. Go to Configure Specific Test, selection. Here you will be able to configure the monitoring (e.g., specifying user name and password to connect to Citrix Cloud). You can also Include/Exclude additional tests for monitoring if necessary. Pre-built monitoring models are available to track the health, availability and performance of components. Dashboards are broken down into layers, A layer model representation simplifies monitoring because metrics are categorized and grouped by layer, which makes it easy to identify where a problem exists. You will see more of this when we look at a component monitored by eG Enterprise. Here you can see KPI reports, system performance,historical analytics, trending.forecasting, etc. This menu provides a view of a system’s current configuration.You can also track changes in configuration of servers where the eG Agents are deployed. Step 2: After successfully logging in , you will be presented with an Alarm pop-up. Because we have not yet configured monitoring and alerting, the alarm window was blank. As this is the initial setup ,please close and ignore this page. Step 3: The main console loads with “No components have been enabled for monitoring”. you can proceed to configure the monitoring in the “Admin” menu. Clicking the Citrix component of your choice, you can drill down to access the performance metrics for that particular component. Here I am monitoring my Citrix Cloud Connector and I clicked on it. In this view, you can see that metrics are groups under different layers for easy problem detection. NOTE: Blue section highlighted has not been configured as of now but will be configured later. Enter the Customer ID & Secure Client File Path. Customer ID can be found on the Citrix Cloud portal > Hamburger Menu > Identity and Access Management > API Access. Secure Client file -> Clicking Create Client on the same page and giving a descriptive name will allow you to create the secure client file. A download of secureclient.csv will then begin. Connector Service has now turned green and Citrix Cloud Connectivity and Citrix High Availability Service Statistics are now available. Drilling down further into the Citrix Cloud Connectivity/Citrix High Availability Service links you’ll see a lot of additional performance metrics and/information which would not necessarily be available through Citrix Director. In addition to monitoring the Cloud Connector, eG Enterprise provides deep visibility of the the other resource plane components including XenApp servers, XenDesktop VMs, hypervisors (VMware, Hyper-V, XenServer, Nutanix, etc. ), Active Directory, storage and network devices, and so on. Similar to the layer model available for the Cloud Connector, there are pre-built- monitoring models available for every component monitored by eG Enterprise. I am specifically targeting the Citrix Cloud Connector and Citrix Control Plane in this blog as other articles by George Spiers and Rory Monaghan exist on the wider platform that discuss eG Enterprise’s monitoring capabilities such as user sessions, application performance, and hypervisor monitoring, etc. eG Enterprise leverages Citrix APIs to monitor the Cloud Delivery Controller. A built-in monitoring model for this component delivers analytics including Delivery Groups, Machine Catalogs, machine registration state, session state, power state, resource usage, load evaluator index, zone details, site details, and more. Without having to deploy any agent in the control plane, these metrics can be obtained. For the purpose of this document, we have only covered the Citrix Cloud Connector. A full Citrix delivery topology view will appear when additional elements/components, such as the Citrix control plane components and the resource plane XenApp servers, XenDesktop VMs, hypervisors, Active Directory servers, etc., have been added to monitor. Topology view provides a full end to end view (single pane of glass) of the Citrix Cloud service, including all the backend services, Cloud Connector, Cloud Delivery Controllers, etc. 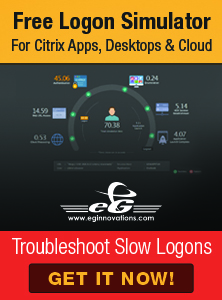 Additionally, eG innovations offers a free Citrix logon simulator, which synthetically measures the time taken for every step in the Citrix Virtual Apps & Desktops logon process. This can be a useful utility to test logon performance and application availability for the Citrix Cloud service and to proactively catch issues. Overall, eG Enterprise from eG Innovations is a great product which clearly identifies and covers gaps in Citrix Cloud monitoring. It has already built a great reputation in the Citrix community for the granularity at which it can help monitor and diagnose common deployment and performance problems to quickly improve end-user experience. Because eG Enterprise provides end-to-end monitoring across Citrix components and the supporting infrastructures, Citrix admins can now say “It’s not Citrix. It’s a …… problem!” This will put a smile on their faces after years of everything being blamed on Citrix. Previous Citrix Cloud – Enabling SSL on Cloud Connector to secure XML/STA Traffic.